Black and gold accents add a contemporary edge to this brilliant resort-inspired space by Kasiaw Designs. 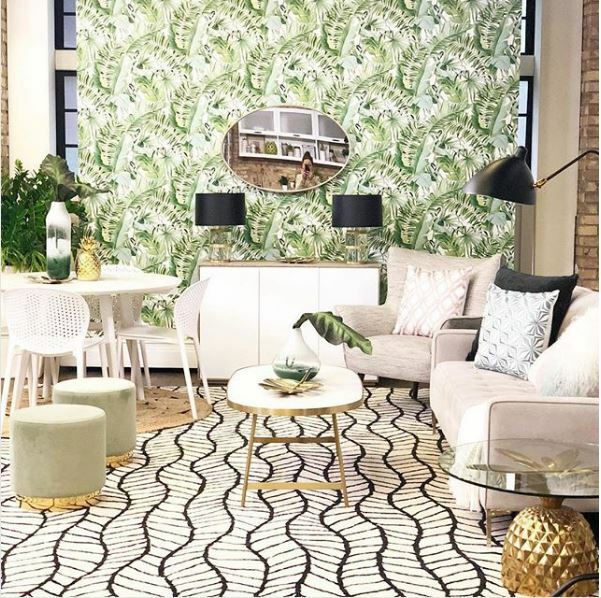 We’re also loving the mixture of the palm print with the wave patterned rug; more is more with this maximalist look! 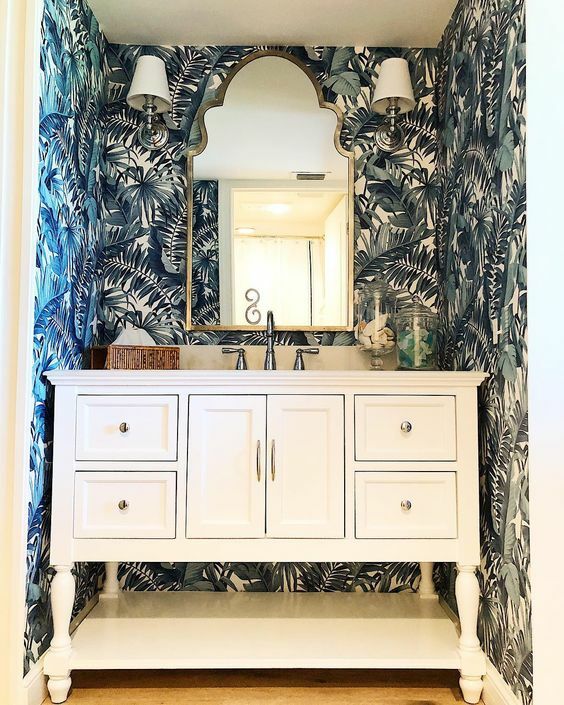 When interior designer Desiree Burns redid her Newport beach home, she “wanted it to feel luxurious but still beachy and cozy at the same time.” We think she nailed it with this powder room, complete with the Alfresco palm print in blue. 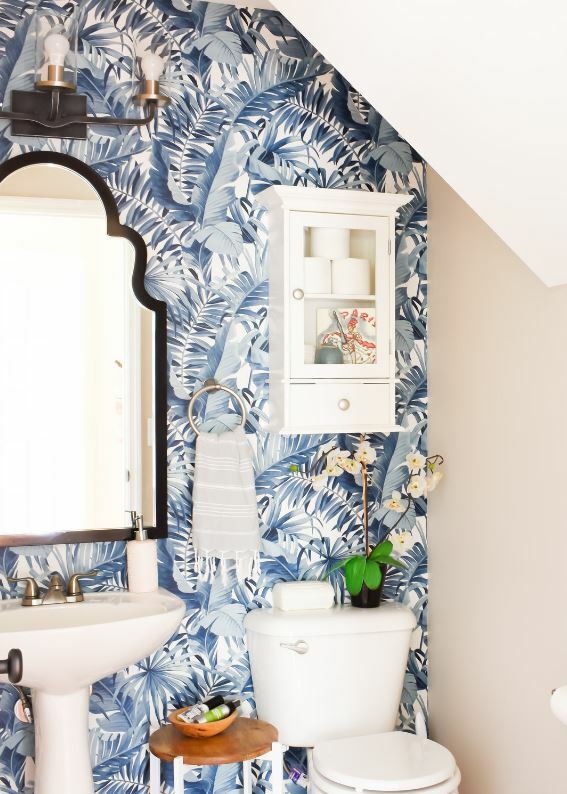 Turn your bathroom into an oasis with a palm print wallpaper. With succulents and vintage botanical lithographs, this room has an effortless boho chic style. 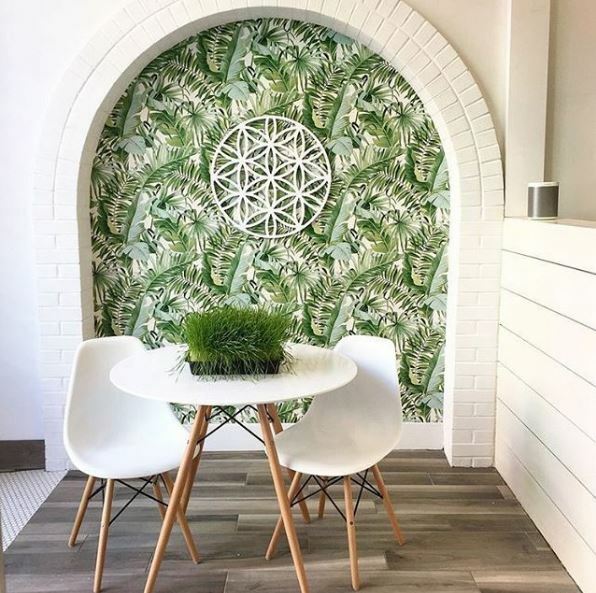 Spotted by House and Home Magazine in the Good Vibes Juice Company store, our palm print wallpaper makes a big impact in this tiny nook. Its surrounding white accents also add to its clean and fresh look. 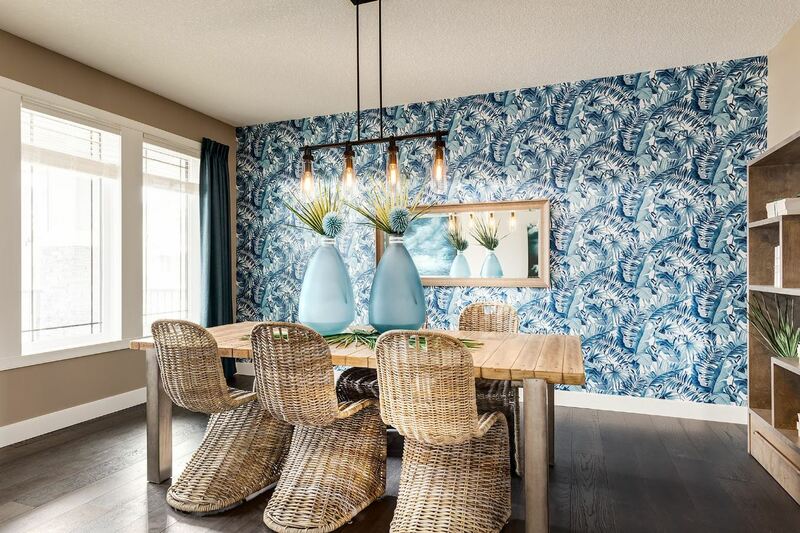 Daring meets soothing with this blue palm print feature wall. The dark wood of the mirror complements the navy shades of the wallpaper perfectly, creating a dynamic and bold look. 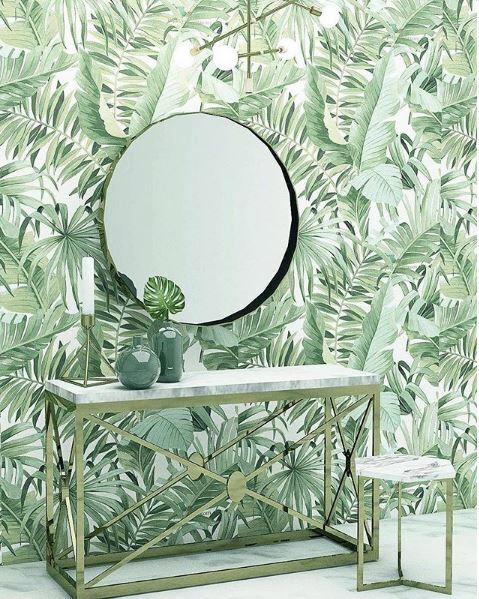 Karolina Bobrowska paired our green palm print wallpaper with white marble and gold furniture, giving this space a modern resort feel. The round mirror and minimalist lamp add a contemporary touch. 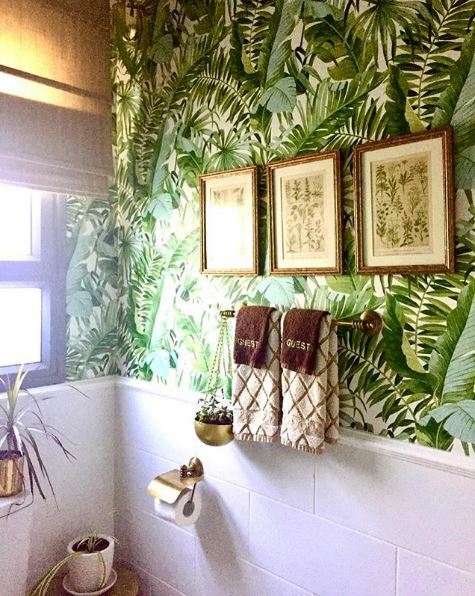 Our Alfresco Palm Leaf Wallpaper adds the perfect amount of color to this fresh, minimalist bathroom. Its green palm pattern complements the copper light fixture. 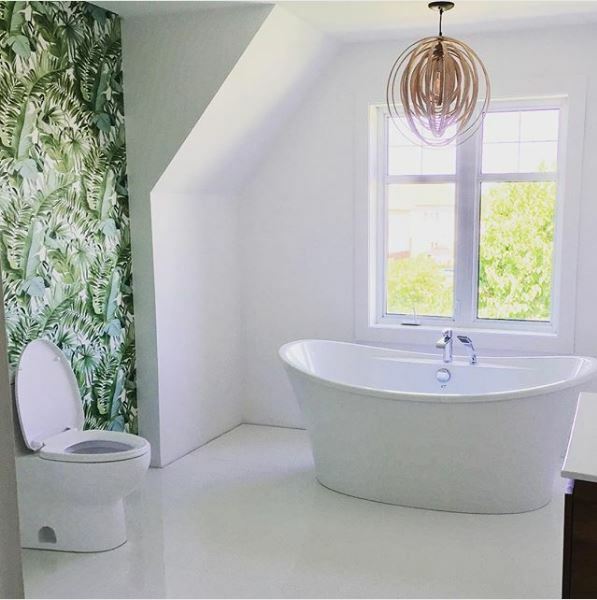 Designed by Homes By Avi, this beautiful $1.2 million house is the grand prize of this year’s lottery in support of Alberta Children’s Hospital. 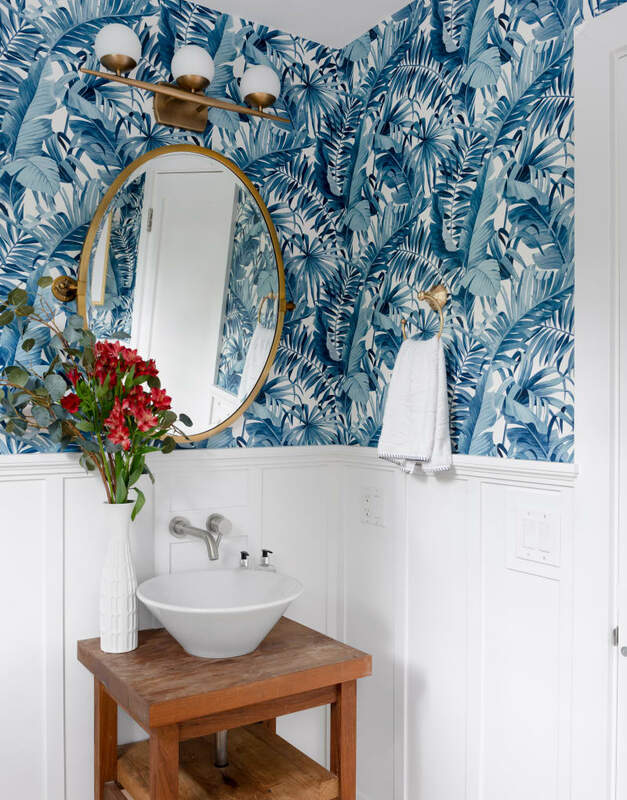 With a brilliant blue hue, this stunning palm print feature wall has an updated, tropical look. Contemporary wicker chairs add to this room’s modern feel. Pink and green are a match made in heaven in this fun and eclectic dining room. 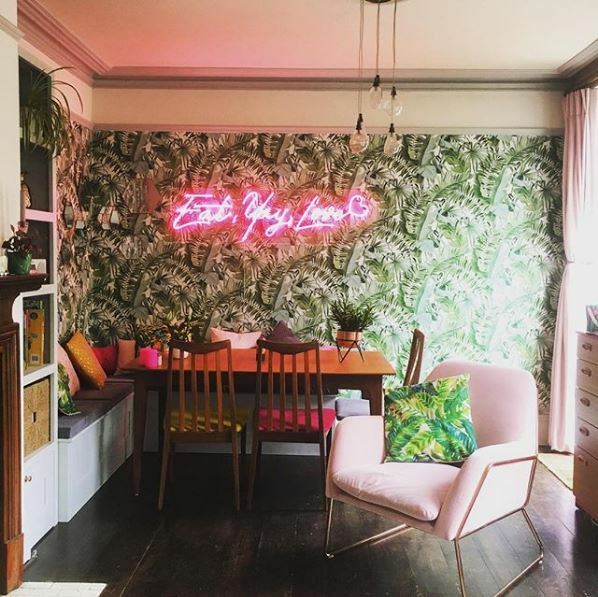 The sign’s playful quote, “Eat, Yay, Love,” adds to the room’s playful vibe, while our palm print wallpaper pulls the space together with a lively touch. In blue, palm print feels more coastal than tropical. The statement mirror, crisp white vanity, and sconces give the fun pattern an elegant twist in this powder room. I don’t typically like palm prints, but the blue one is stunning!